My post today is both happy and sad. These are shadow boxes I made for our neighbors for the last decade who have watched out for us and our house and plowed our driveway every winter. They have been great neighbors and friends. 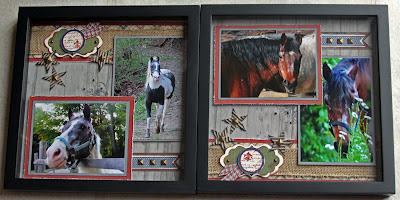 The horses are their family horses and I've taken pics over the years and thought they might like them to display. I used papers from the new Dakota papers and Victory. I think they work really well together. 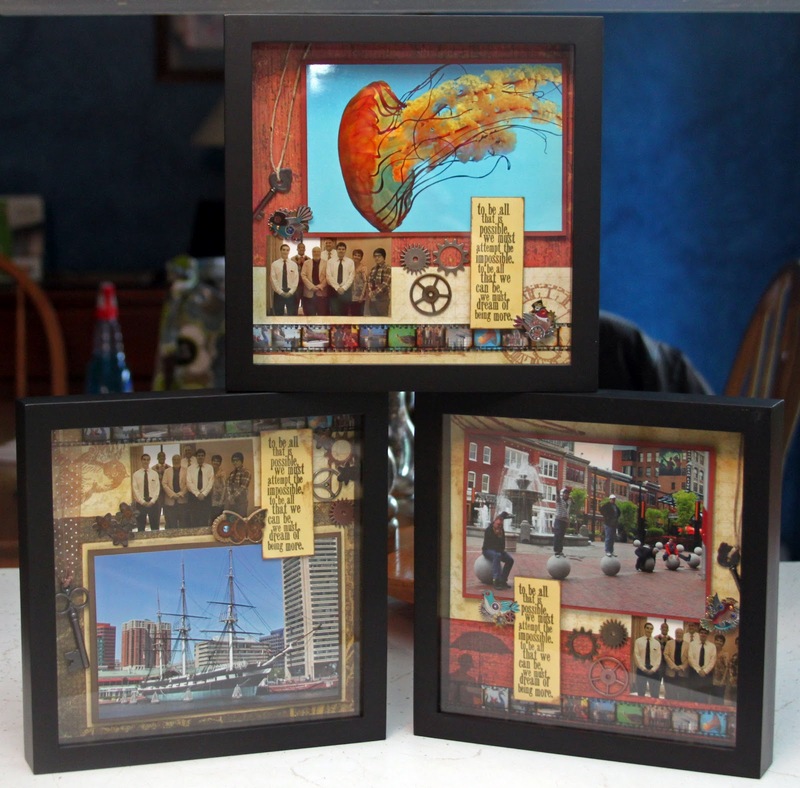 I think shadow boxes are my favorite things to make because they don't take long and they make a big impact. I love being able to be dimensional too without having to worry about everything fitting in a scrapbook and being squished. The sad part of my post is that this is a goodbye of sorts to our neighbors and to my friends and customers. Some of you know and some may not that my husband and I are moving out west. 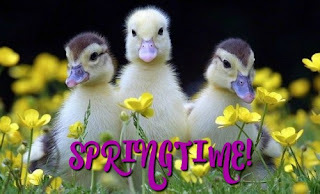 We have family out there and love the weather. Yes, we know it's hot and even though it's a dry heat 115 degrees is HOT! But, as my husband says, you don't have to shovel sunshine! Thank you to everyone for everything and we hope to have lots of visitors after we move. I will be back to visit (Pat says not so much)...lol. At the end of this month, we're heading out. For those of you who would like to continue to shop with me, I will still be with Close To My Heart and try to build my business out there and you can shop from my website or contact me and I can order for you. My contact info will be the same. If you prefer to do business locally and/or want to have a workshop or gathering, please let me know and I have a couple really great and talented ladies I can refer you to. I'm putting together a card workshop with the Victory papers. 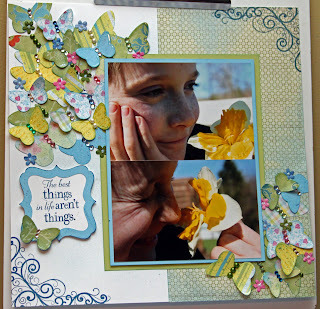 I used a combo of the Victory WOTG and the new Make It From Your Heart book. Because the Victory WOTG won't be available, I decided it would be best to use some of the patterns from the new book. I couldn't help but use the stamp set that came with the WOTG because i just love that set. But it makes a good point... get them while you can! Since the Victory papers are still available I know it will still work and the patterns from Make It From Your Heart make it a must have! 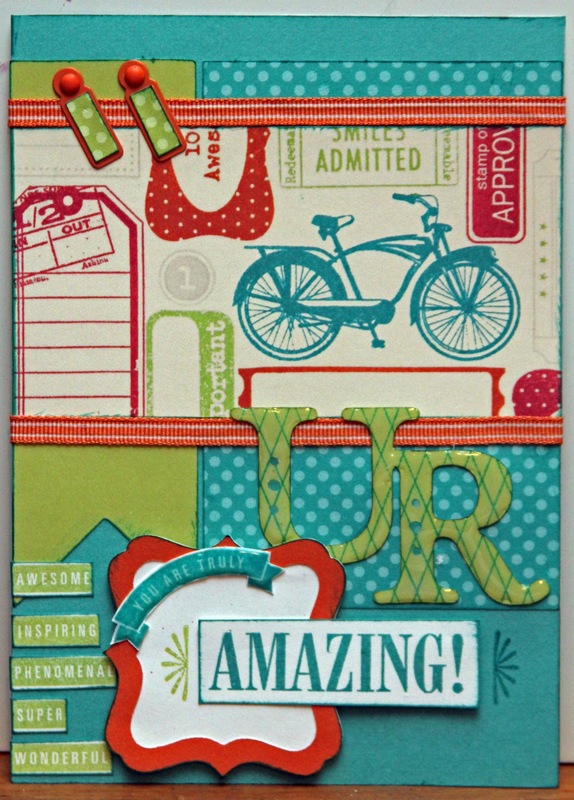 And check out the bicycle card; these stamps are from the National Stamping Month special , a double stamp set for only $5 with a qualifying purchase! 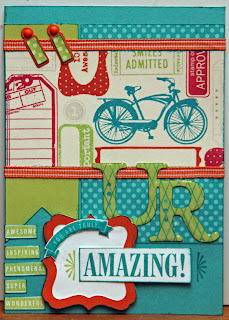 I also used Artiste and a couple of the stamp sets that go along with the new Cricut cartridge. So, this morning my youngest had his graduation ceremony from the Culinary Program. He has had some of the best and most caring teachers influence him and keep him focused and motivated. He was Team Leader of a Culinary Management Team that won the NYS Restaurant Association's Prostart Competition. They went on to Nationals in Baltimore and while they did not win they won the respect of many judges. I went along on the trip as the unofficial "official" photographer. I knew it was something I had to do. It was a bad time money wise and time wise, but YOLO, right? I am so glad I went. I had the opportunity to see the interaction between him and his teammates and his teachers and it was inspiring and made me so proud. I wanted to thank his three teachers that were on the trip so we picked out three pics that we thought would be the most meaningful to each of them and I made these shadowboxes. I was short on time. Almost none of the products are Close To My Heart.. very unlike me because I LOOOVE our products. 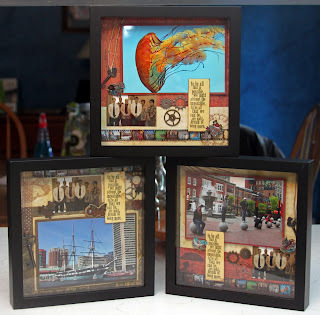 I went to JoAnn's to buy the shadowboxes the other night and knew I better get some pre-made embellishments. I needed mostly masculine items as two of the teachers were men, and the one for the female teacher was the ship so I really couldn't fill it with flowers. 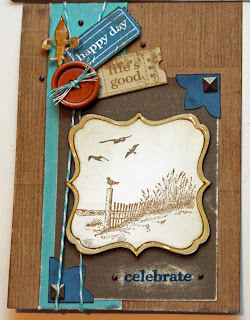 I got mostly products from Tim Holtz and Jolee and since I'd already slipped into the abyss I decided to use paper from CM that I had bought at a rep's crop. Each one has a key in it to signify how they were key to the kids' success and development. My favorite product find was the Filmstrip Ribbon from Tim Holtz. I shrunk some of the pics from the trip down to size and strung them together and placed them behind the clear filmstrip ribbon... I LOVE the look of it... 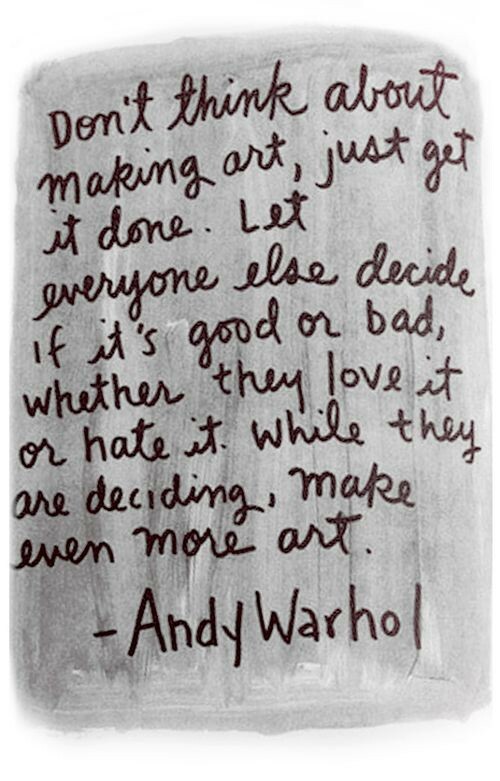 I can't wait to use it on a scrapbook page. Never fear.. tomorrow I will be back to my CTMH ways.. but it was fun to stretch my creative muscles a bit and use some different products. BTW... I think the teachers liked them! 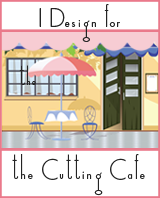 This week's challenge at the Fantabulous Cricut Challenge Blog was "On The Go". Our project was to include a car, bike, train, plane, etc. 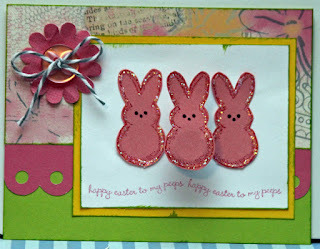 I used the Dotty papers again. One of the papers has this great bicycle on it. 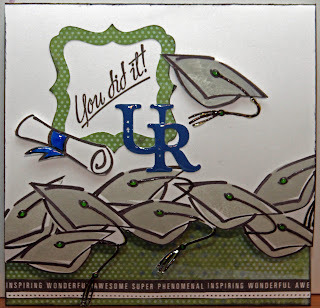 The cartridge I used was Art Philosophy for the banner, the decorative square and the letters "U R". 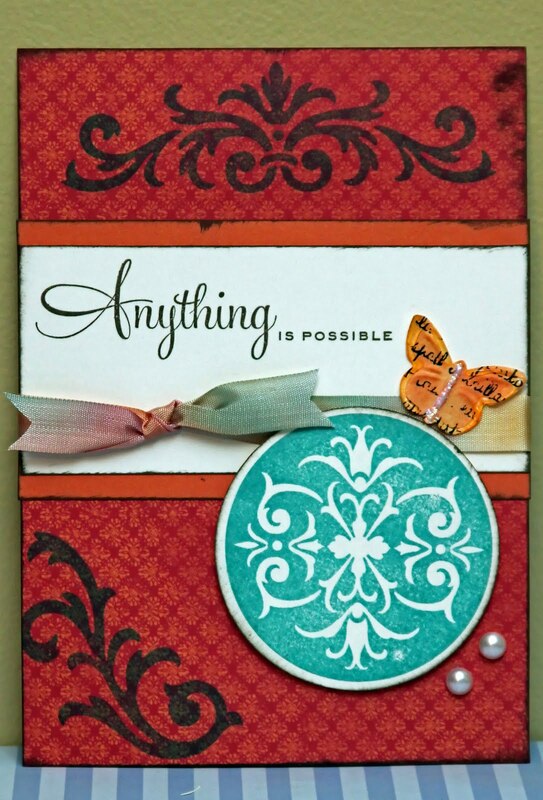 I used April's CTMH Stamp of the Month You Are for all the sentiments. The colors are Lagoon, Sweet Leaf and Sunset. 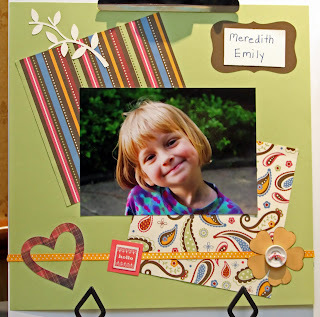 This week's challenge for the Heart2Heart Challenge Blog is a Photo Inspiration Challenge. 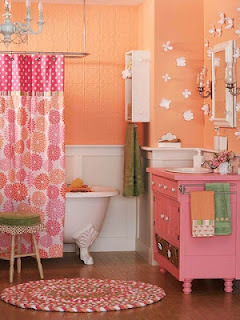 What caught my eye was the polka dots and the flowers on the shower curtain as well as the colors orange and pink. 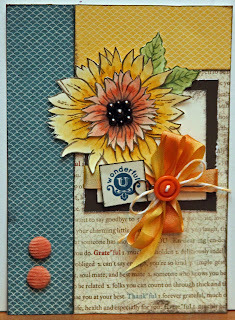 I used Sunset and the Smoothie paper from the Dotty paper pack. 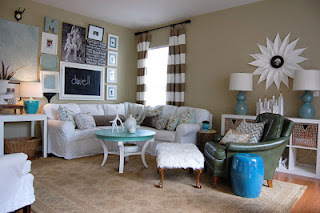 I also used Grey Wool as an accent. 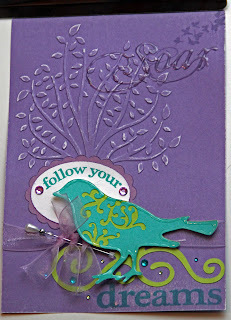 I used Wonderful You stamp set for the sentiment, and the bird was from the Color Ready Wooden Shapes. I painted it with the pearl paint and then dabbed some grey ink on it and added a pearl for an eye. 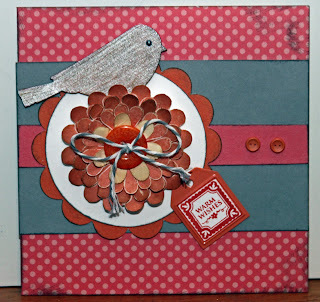 Last week's Heart2Heart Challenge was to use stitching, real or faux on your project. 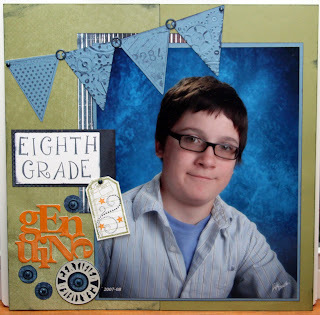 I have been working on my son's school album since he's graduating this year and this is one of the portrait pages. I did some hand stitching with baker's twine on the upper left hand side of the layout and used our acrylic ruler to punch the holes. It took some time, but I like the look of it. I've yet to try stitching with my sewing machine....maybe someday...lol. The colors are Outdoor Denim, Goldrush, Indian Corn Blue. The papers are from an old retired pack. 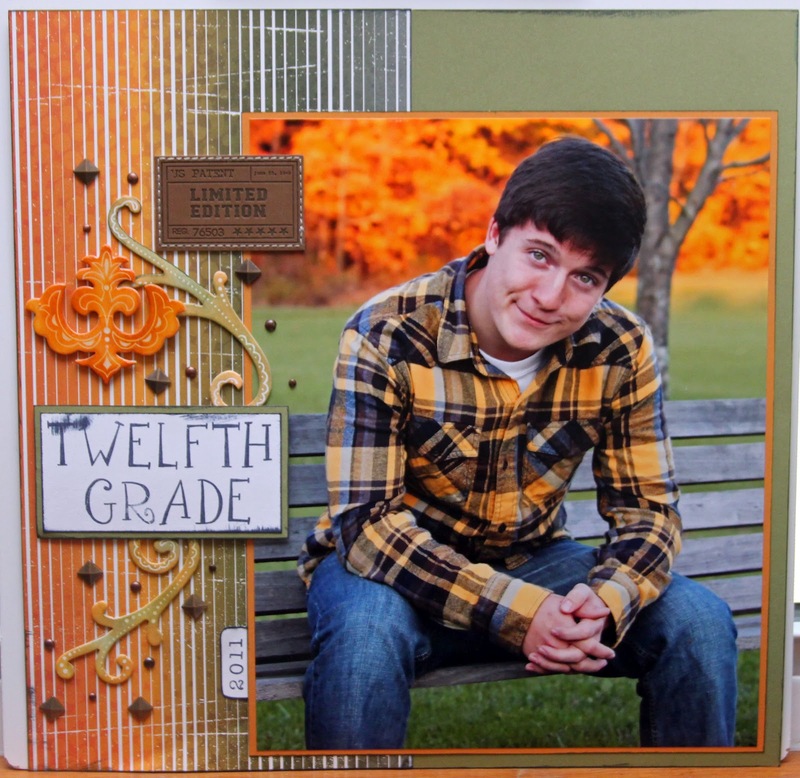 Had a fantastic weekend in Chautauqua scrapbooking! 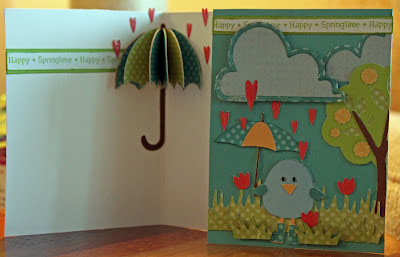 I made this card for the Fantabulous Cricut Challenge Me Monday #107 April Showers. Our project was to include something with an umbrella, clouds or rain. 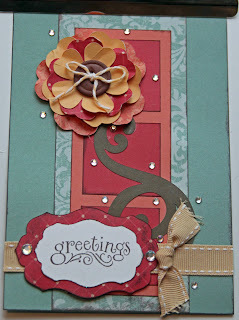 The left side is the inside (I didn't attach the card front yet). I got the instructions from a Cricut magazine to make the popup umbrella on the inside of the card. I used Create A Critter for the umbrella; Three Birds on Parade, Art Philosophy and Everyday Popup cards. The paper is this month's CTMH special, Dotty For You and I cut the clouds out of one of the papers from the pack. 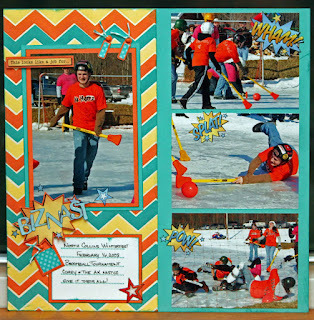 This layout of my son playing Broomball a few years ago was done with one of the Dotty For You papers. It was perfect for the layout and the Superhero rub-ons worked perfectly with it as well. I used my Art Philosophy alpha to cut out Corey's team name and trimmed off some of the letters to make it look more like the font on the rub-ons. 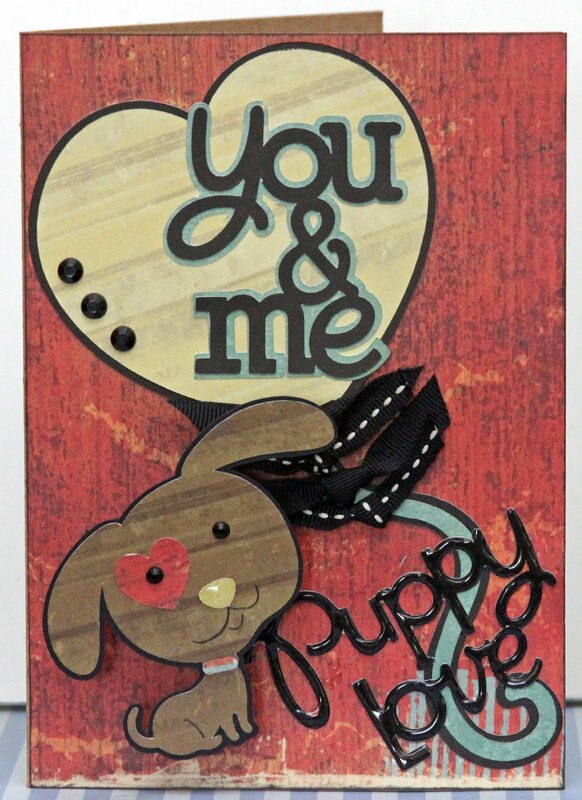 This week the Heart2Heart Blog is having a Sketch Challenge. I used a lot of things I bought a while ago, but hadn't used yet or in a long time. The paper is Mayberry. 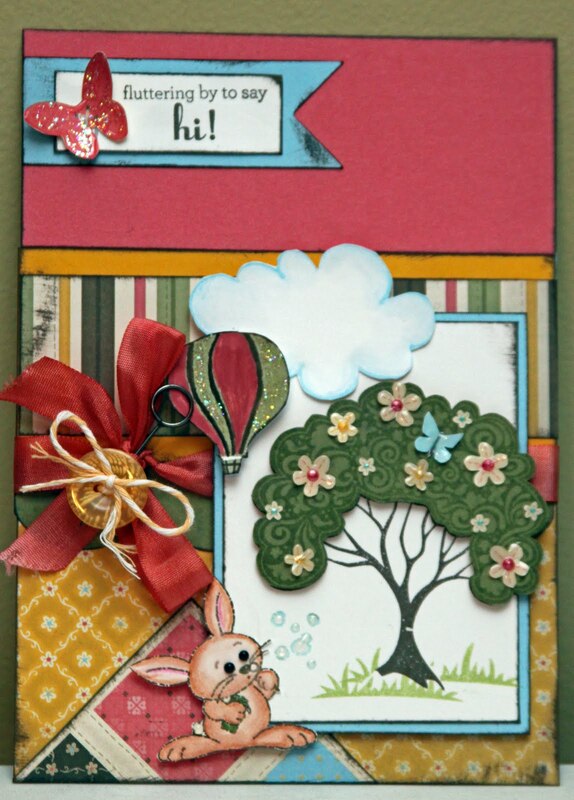 Stamp sets I used were A Tree, Bunny Love, and Over the Rainbow. 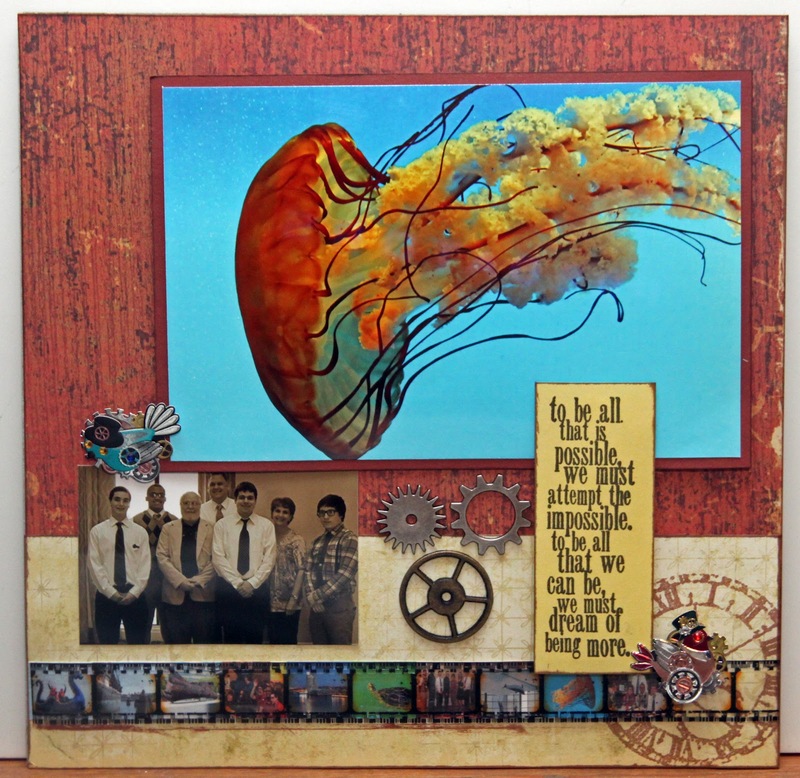 Check out the Heart2Heart blog and all the great artwork and play along! I was at a workshop last week and one of the girls there taught us how to make a 3-D Pyramid card. 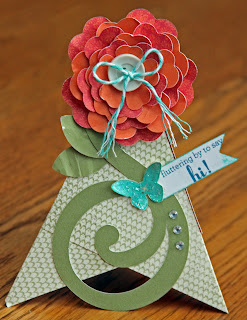 If you've never seen one of these, they lay flat to mail and then you can make them stand on their own. She had made these for her Christmas cards and made Santas out of them. Sooo cute! So, I decided to try one and am going to do it as a class at a crop next month. 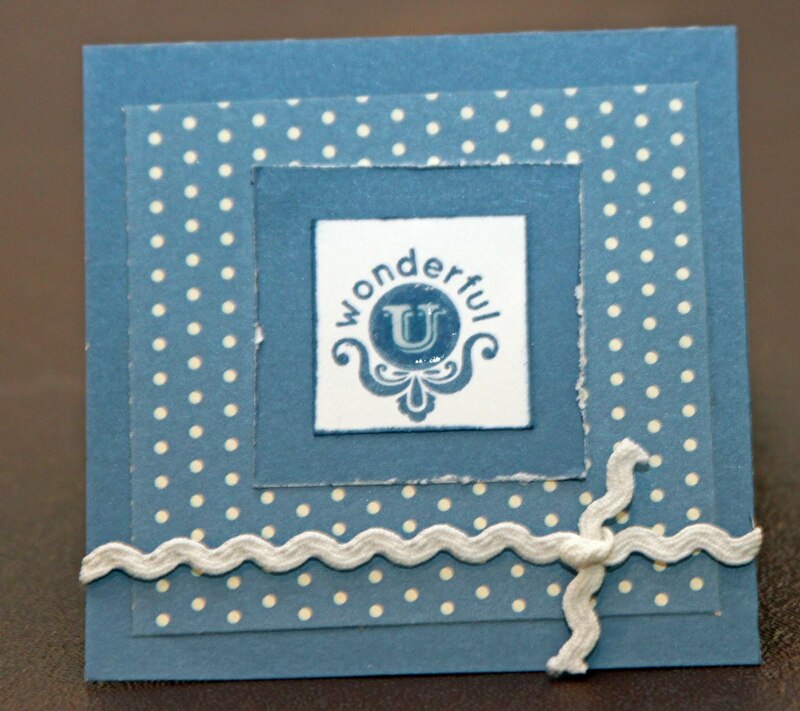 I'm entering this card in the Fantabulous Cricut Challenge #106 Buttons and Bows. I used Stella papers. The flower, leaves, and flourish were cut from the Art Philosophy cartridge, and the butterfly was cut out of one of the Dotty For You papers. 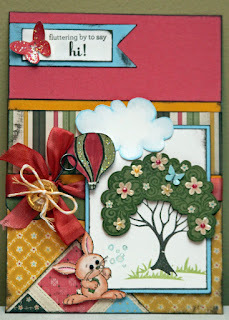 The sentiment is from the stamp set A Tree. 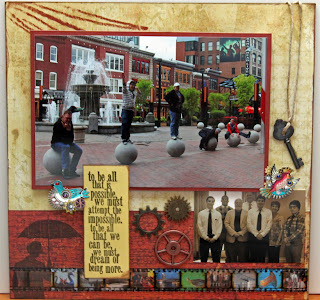 So my Dotty For You papers came in last week and I decided my first project with them would be an Easter layout of pictures from last Easter. The colors in this paper pack are so pretty and bright they are perfect for Easter and Spring projects as well as so many others. I also used Cricut cuts from Art Philosophy and Give A Hoot. 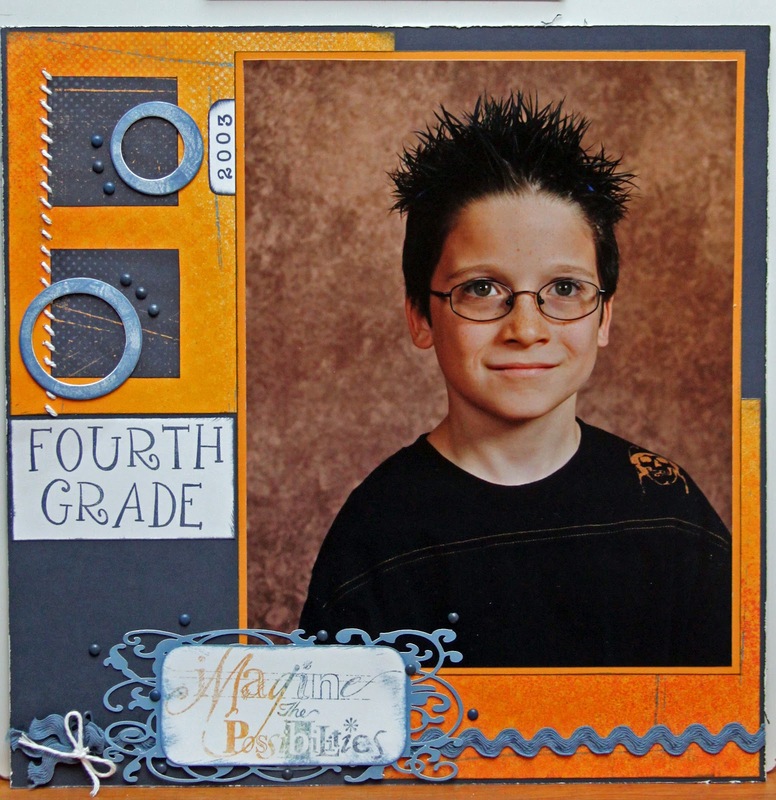 Stamp sets were My Peeps, Word Puzzle, Say It In Style. The butterflies are from Just Blooms. 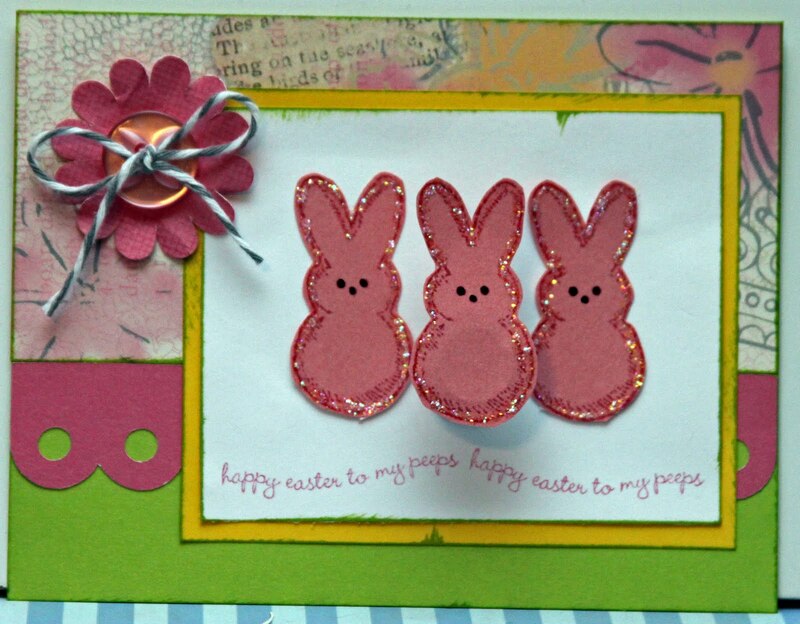 I'm entering the layout in the H2H Challenge for last week to create something for Easter or Spring and in the Fantabulous Cricut Challenge Me Monday #105 to create something with eggs. 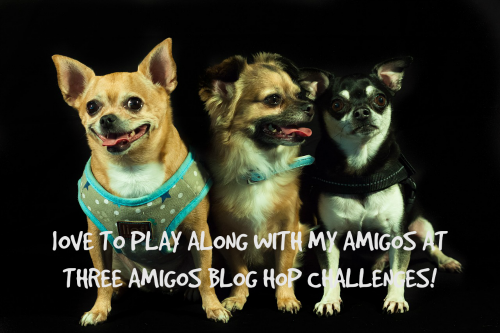 Please do visit both of these blogs to challenge yourself and have some fun! I started this card knowing I wanted to create a card using the Octagon shapes I've seen on so much artwork lately. It was for a workshop so I cut all my Octagons first... dozens... then when I went to put the card together and tried fitting these Octagons together like they are on all the great designs I've seen I couldn't make them fit. I moved them around; stared a bit; and finally I realized.... what I really wanted was Hexagons!! Well, instead of re-cutting the shapes, I decided to work with what I had and this is what I came up with. 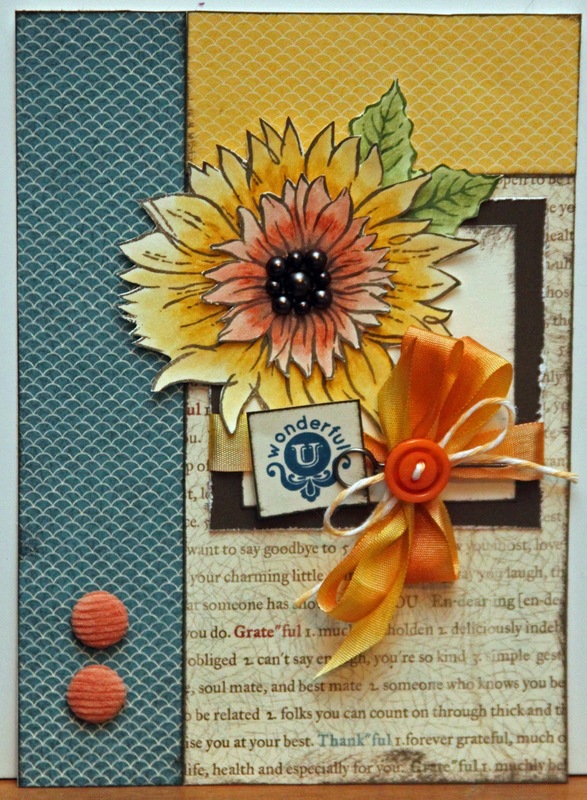 The paper is Florentine, the flourish is from the March SOTM Potential and the flowers are from Just Blooms. 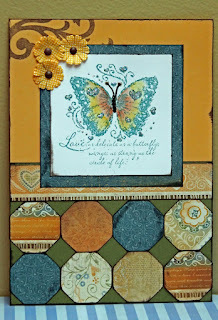 The stamp I used is Quick Cards Butterfly. 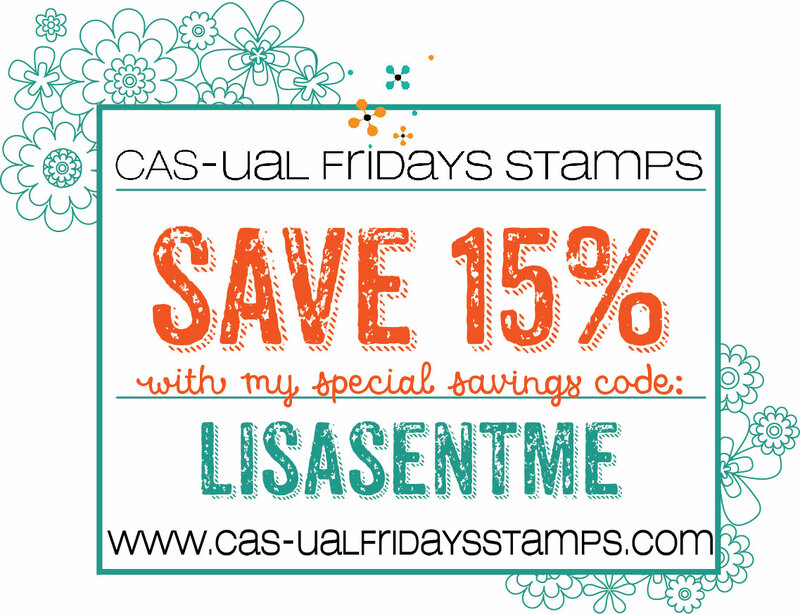 It's a new month and along with that comes a new special and Stamp of the Month! This month's special starts April 17th and continues through the end of May. It's our National Scrapbooking Month special, Dotty for You! 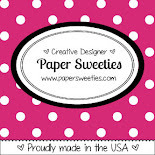 It's a fantastic paper pack that you can get for just $5. Check out my website for more info by clicking on the "Shop With Me" link. This card is not my original idea but I loved the combo so much I decided I had to use it. Bowwow was one of the first sets I got from the new Idea Book. I loved it. I just didn't know what to do with it... that's a lot of coloring and how would I do it and make it look good? 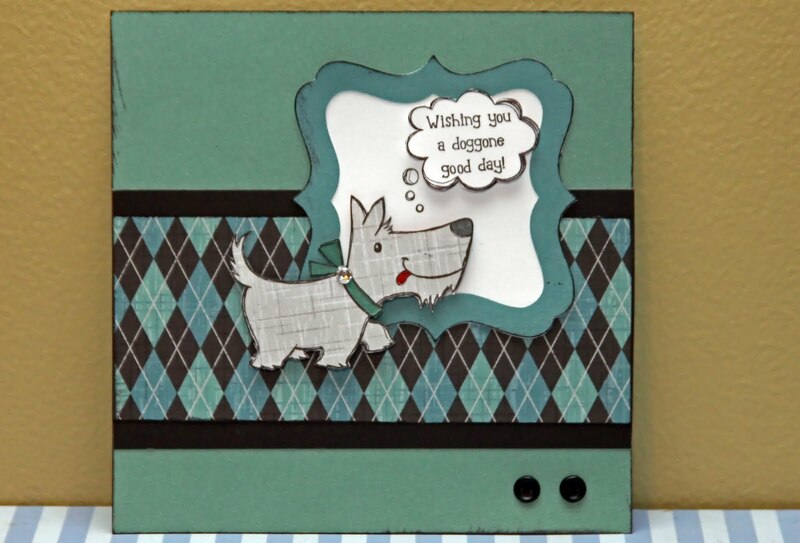 Then I saw a card someone made using the Grey printed paper from the Cruisin' Paper Pack. Oh yeah! 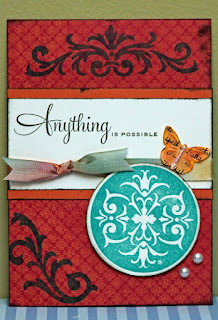 Stamping on printed paper! I have also seen some really nicely colored dogs where people have done some great shading, but what could be easier than just stamping on the right printed paper!? Along with the argyle print from the Cruisin' paper pack... you can't lose! Well, the end of the month is here along with your chance to get the March Stamp of the Month, Potential, and to get an added bonus, a free Art Philosophy bundle, if you sign up to be a consultant. You have until tomorrow and you can take advantage of these specials by calling me or visiting my website, and the sooner the better! This card was another we made at Donna's workshop Monday. All of the images are from the Potential set. The paper is from Stella. I colored our Color Ready Seam Binding Ribbon using sponge daubers and ink pads for a sort of tie dyed look. 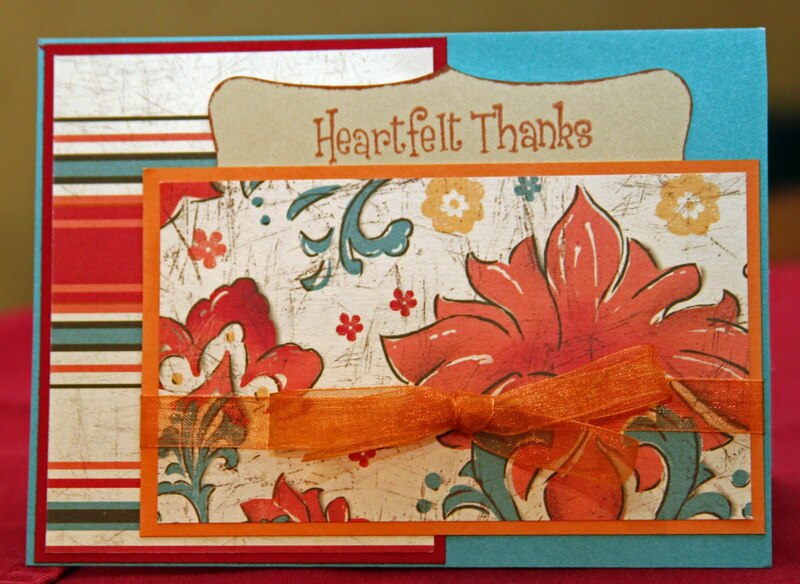 It is so much fun to color this ribbon in whatever color(s) match the project you are using it on! 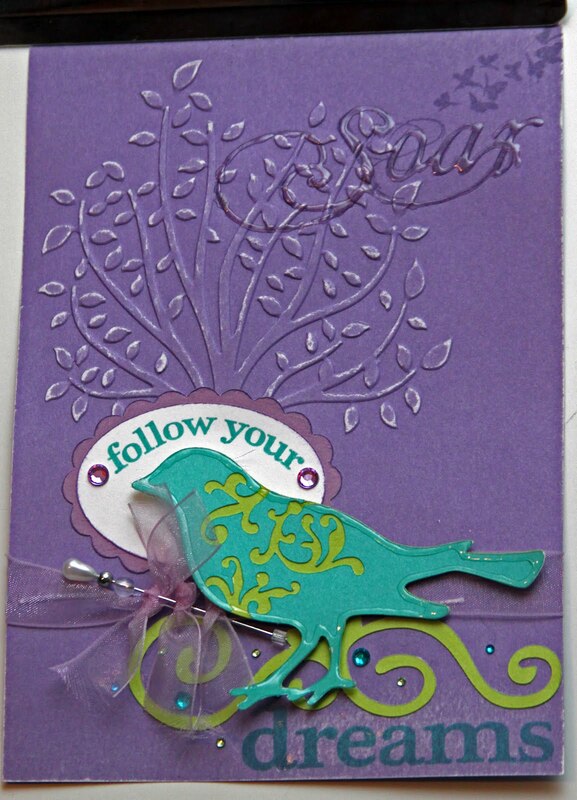 This is another card we did at Donna's Workshop Monday night. 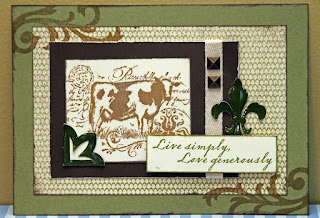 I used the new stamp set Country Life and this month's Stamp of the Month Potential for the flourishes. The paper is from Stella (believe it or not)and the Fleur De Lis and Corner decoration were cut from the AP cartridge and of course covered in Liquid Glass. This is my Ode to Donna who has a slight cow obsession! I'm sorry to say it will be my last workshop that I do for Donna but I'm happy to say it's because she is now a Consultant! I've been telling her for a long time she should do what I do because she is so creative and with the March sign up special she finally took the leap. Welcome to Close to My Heart, Donna! You can check out her blog HERE! This is a card we're making at a workshop on Monday. 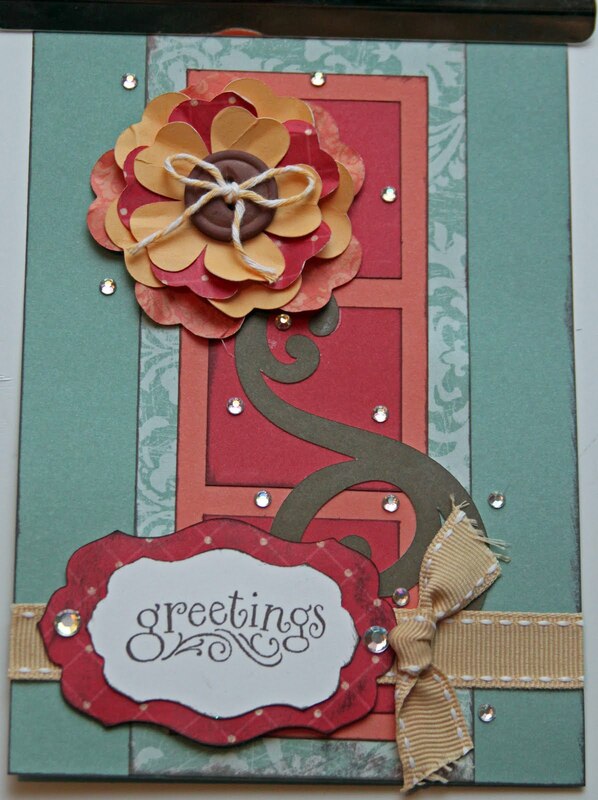 It's one of five cards and pretty much a knock off of one in the Spring/Summer Idea Book. One of the "Peeps" is popped up with our new Adhesive Springs which adds so much movement and "bounce"! 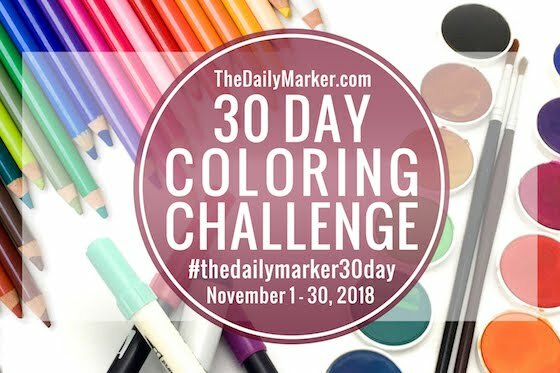 I used the colors for this month's challenge for my customers which is a color challenge. The colors are Cotton Candy, Sunny Yellow, and Pear. 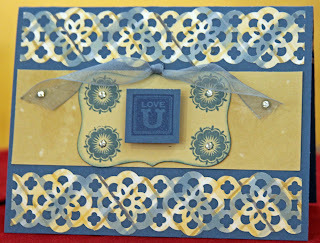 The printed paper is from Lucy, I used the AP cartridge to cut the scallop border and the flower. 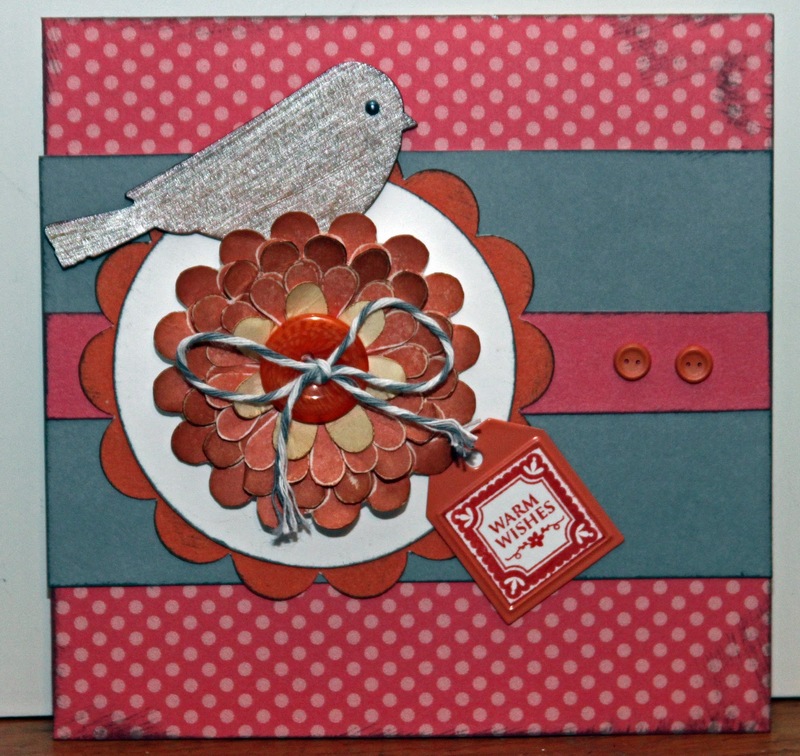 The bow in the button is baker's twine and I used the My Peeps stamp set and Universal Backgrounds to add a little texture to the flower. 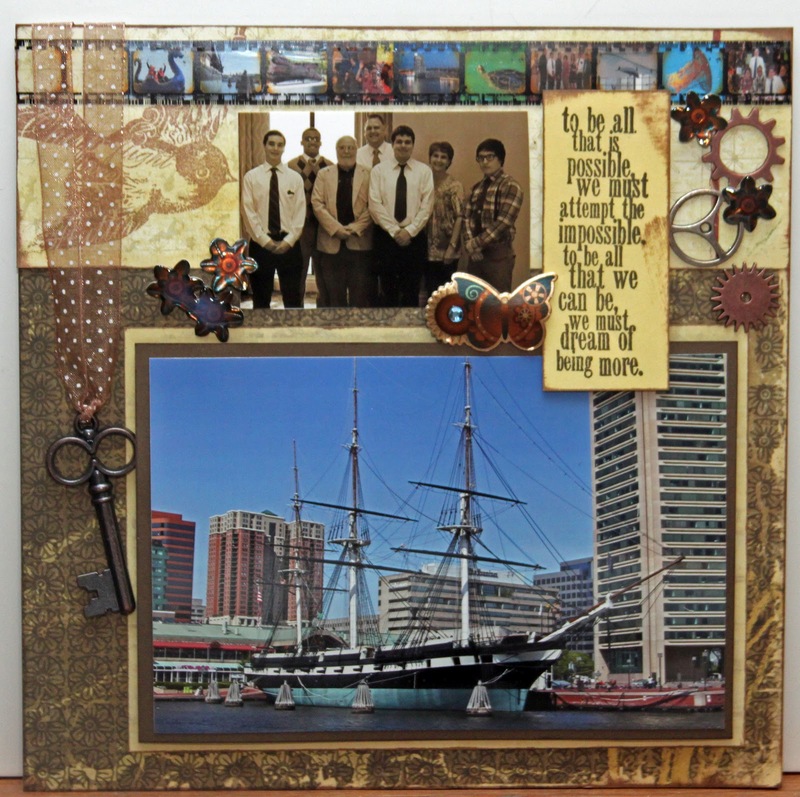 Here is a layout from the challenge at Byrncliff that Brooke created. 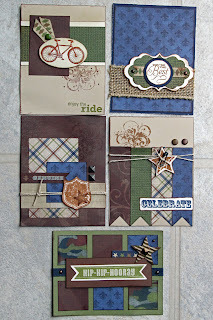 She did a great job including the CTMH products along with some other papers and Cricut cuts she had in her stash! 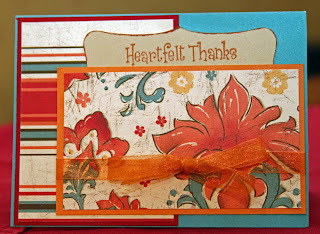 Last week's challenge at the Heart2Heart Challenge Blog was a color challenge. 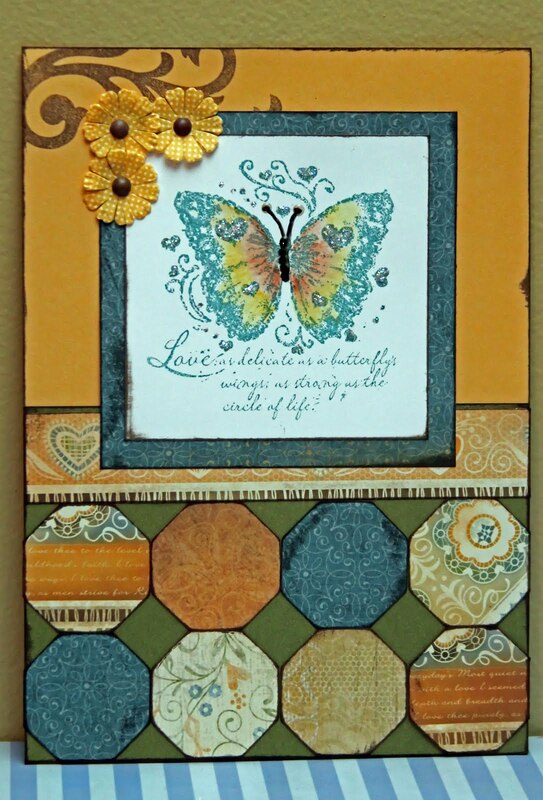 The colors to use were Sweet Leaf, Sunkiss Yellow, and Sky. 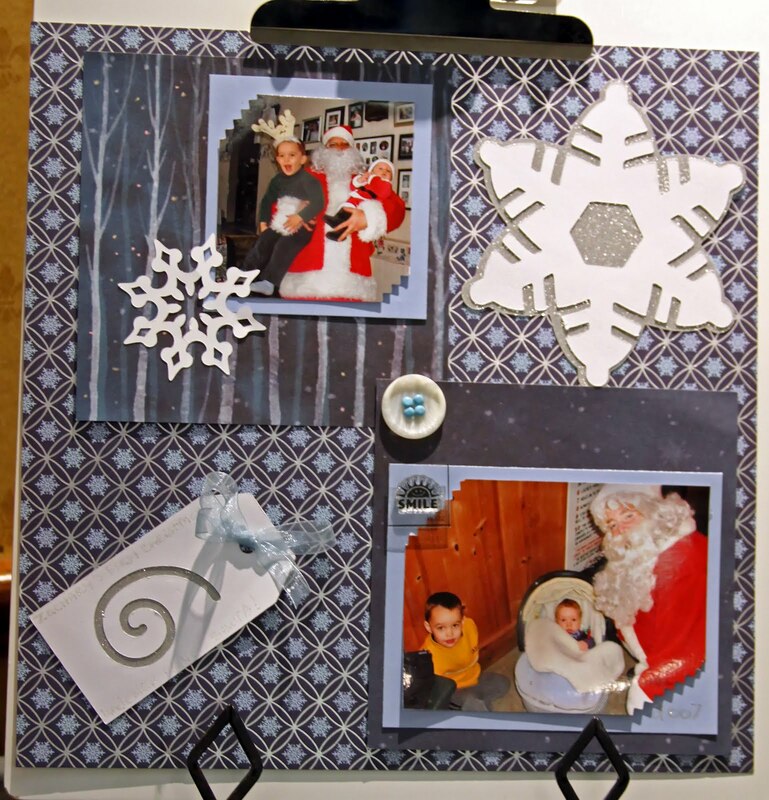 My inspiration for this layout came from a layout in Cricut Magazine. The clusters in that one were flowers instead of butterflies. 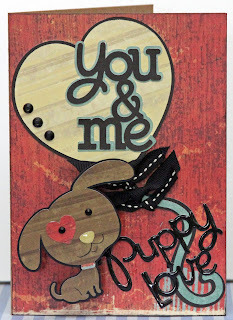 I used the stamp set Best Things. The butterflies are from the Art Philosophy cartridge and cut out of various paper packs and stamped papers. 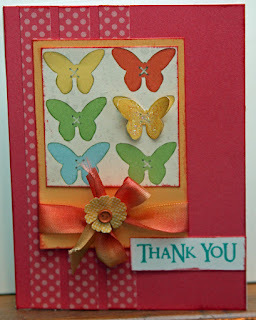 I used the spray pen to splash a little extra color on the background and the butterflies. 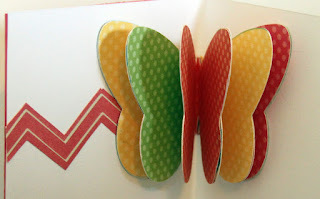 I used liquid glass on some of the butterflies wings to help them lift a little. 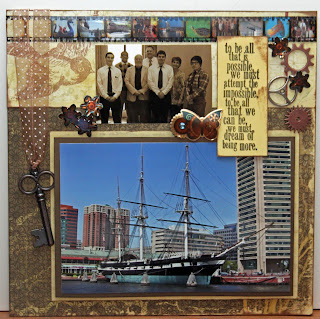 This is a page Denise Georger created with the items in the Challenge baggy at Byrncliff. Denise's papers were from the Magic paper pack... an oldie but a goody... great layout! 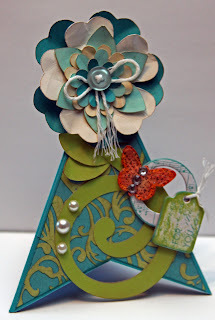 This week's challenge on the Fantabulous Cricut Blog was to use shamrocks or the color green on your project. The card I made is for a friend who has a new home. The inside of the Wishing You... sign says "Luck and Love". 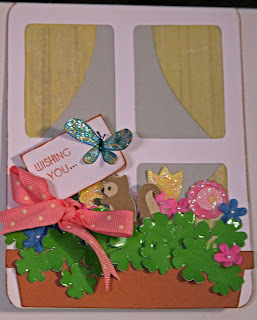 I used the CTMH Art Philosophy Cartridge to create the window; Give A Hoot for the squirrel and the shamrocks; Everyday Popup Cards for the flower box/flowers. I used Liquid Glass to accentuate the shamrocks and Glitz Glitter Gel to glitter the flowers and butterfly. 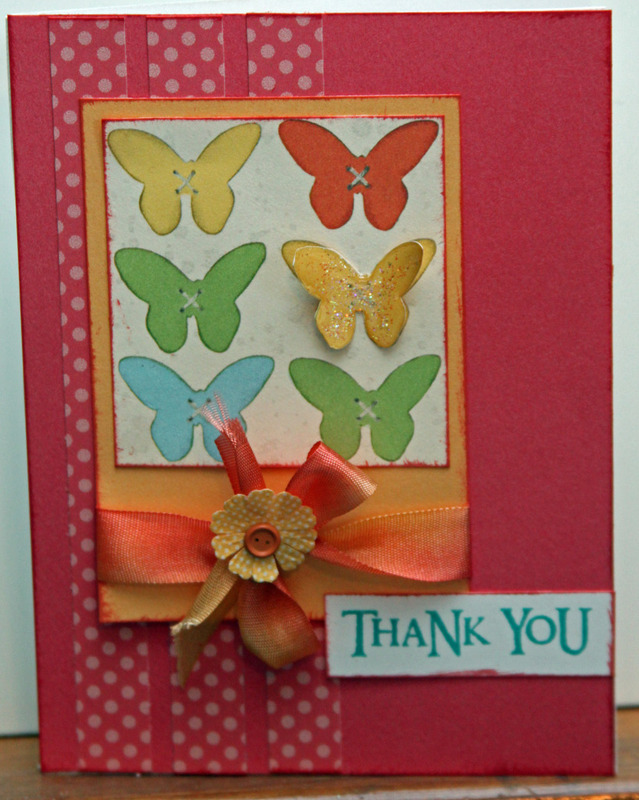 The stamp set I used was CTMH's Word Puzzle for the butterfly and the sentiment. 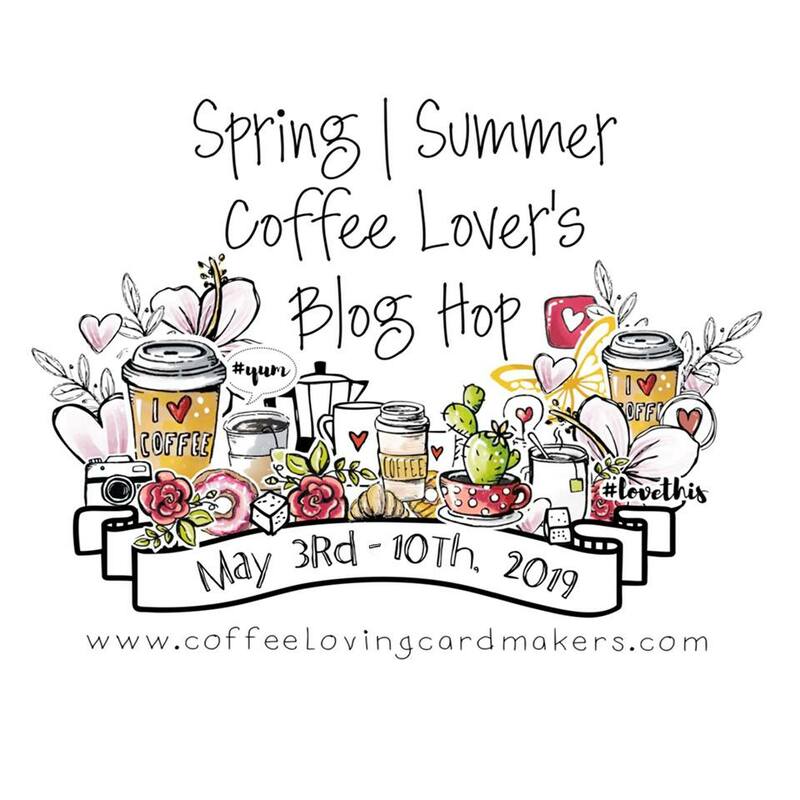 Check out the Fantabulous Cricut Challenge Blog and all the great artwork that has been submitted for this and other challenges. 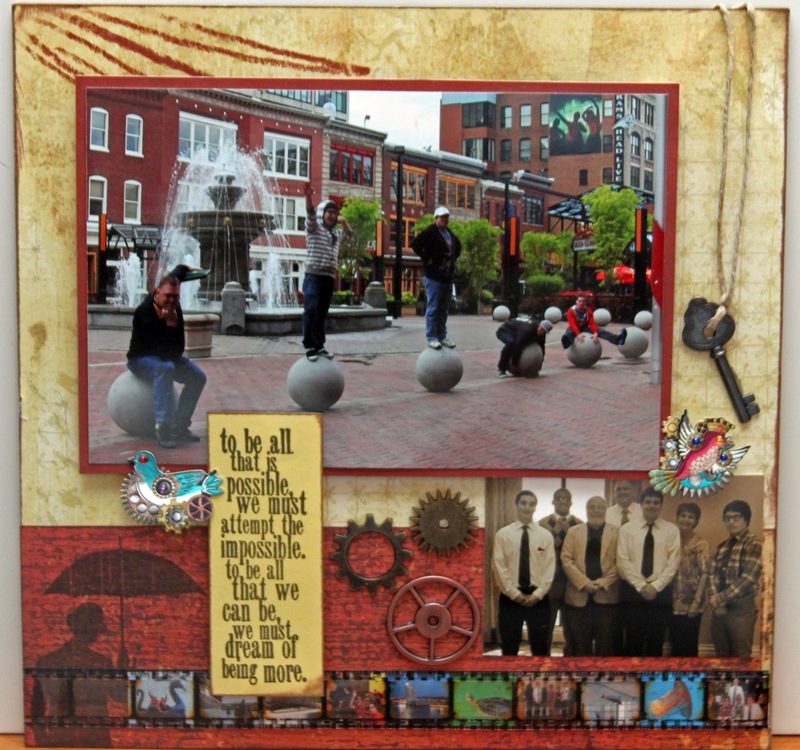 Don't forget about the February challenge to use Rock the Block and/or the Collage Cubes in a project! You don't have to do anything with the cubes if you're not ready. Just use the Rock the Block stamp set on a piece! There's about a week left to submit your pics. 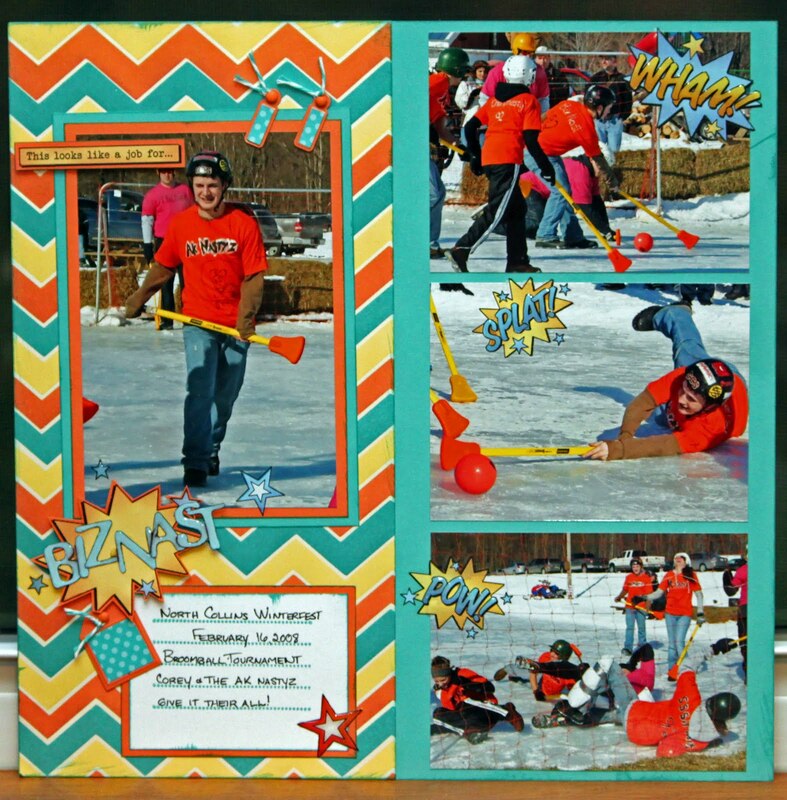 Had a great weekend at the semi-annual Byrncliff crop! Good food, good company, lots of fun. I gave the ladies a baggy with some printed paper, a couple small stamps, a Cricut shape, and a button. 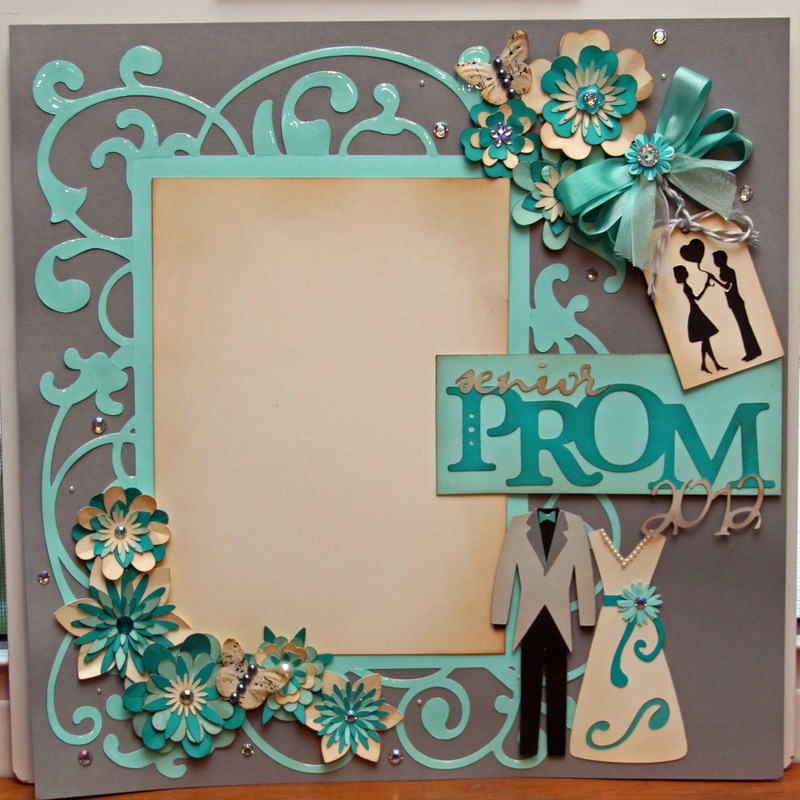 They chose 1 foot of ribbon and 1 piece of cardstock. I challenged them to create something with these items and had a drawing from all the entries. 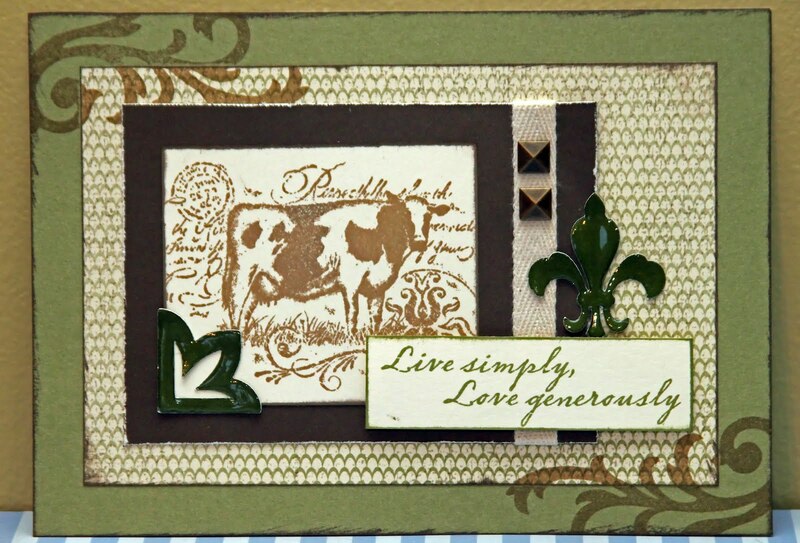 This is a card made by Lucille McMullen. Lucille also won the drawing. 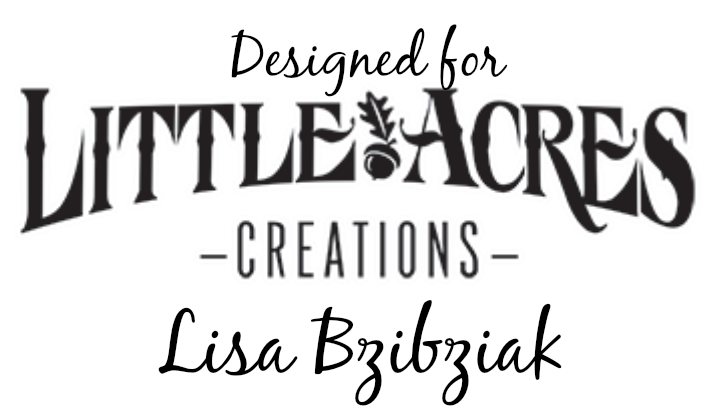 I'll be showcasing all the creations over the next few days. 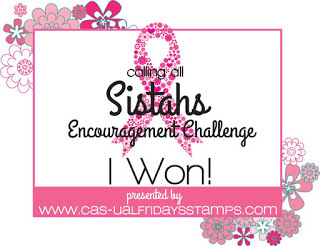 Thanks so much ladies for playing along! 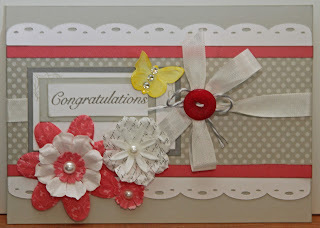 Here is my card for the Celebrate The Occasion Challenge. 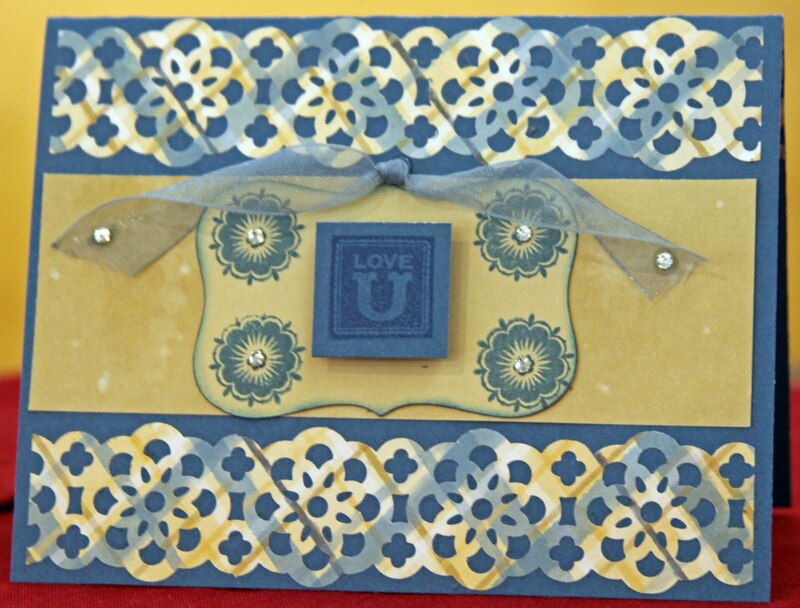 We were to create a birthday card using bling. I cut the flowers from the Art Philosophy cartridge as well as the frame for the sentinment and the flourish for the flower stem. This week's Fantabulous Cricut Challenge was a color challenge. We were to use purple, turquoise and green. I used my cuttlebug to emboss the tree. The cartridges I used were Give A Hoot for the bird and flourish, and Art Philosophy for the sentiment frame. 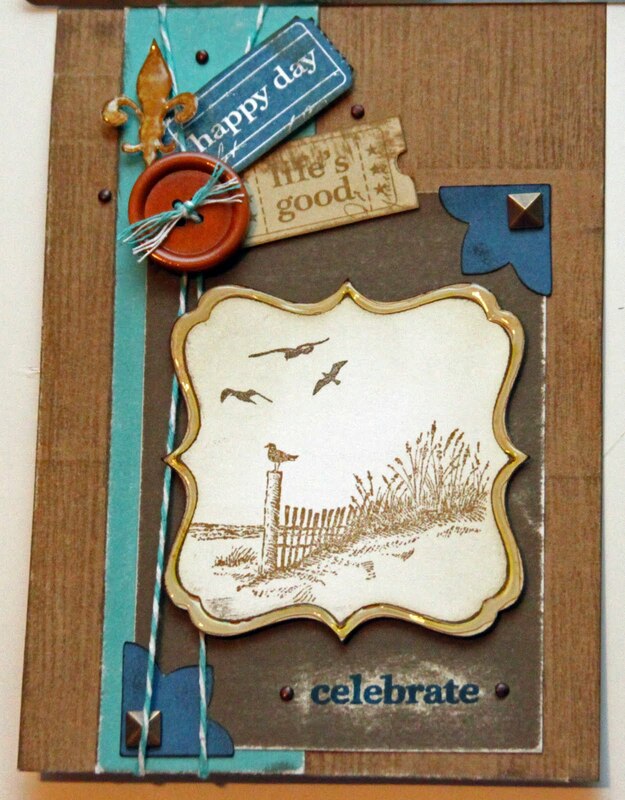 The "Soar" at the top of the card is from a future CTMH stamp of the month and the other words are from You and Me. 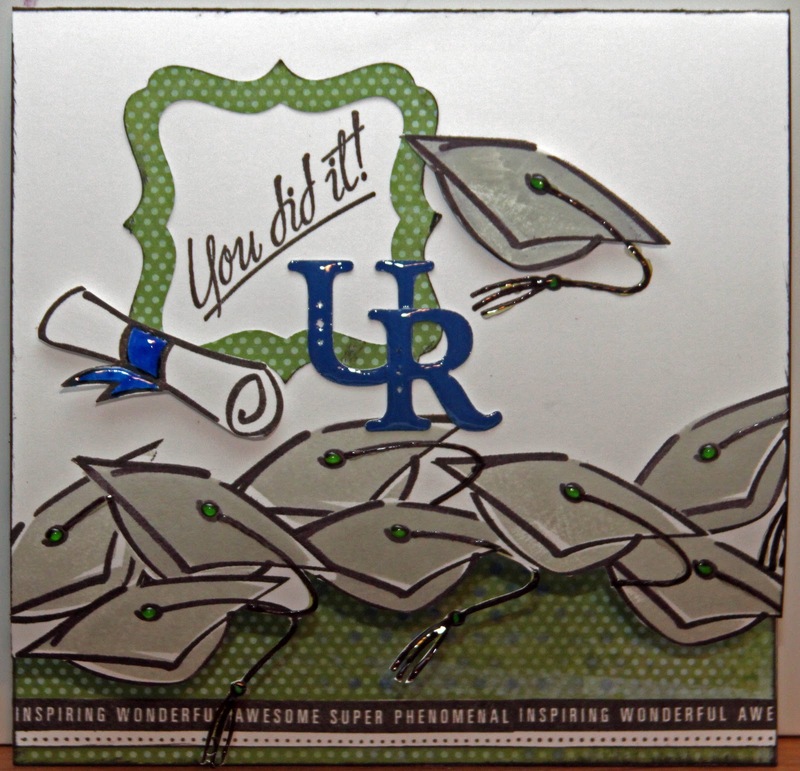 I added some Liquid Glass, bling and ribbon from CTMH to finish it off. 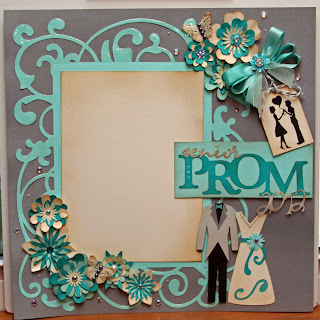 If you love to play with your Cricut, check out this challenge blog. Even if you don't own a Cricut, check out the fabulous artwork. You may find you "need" one..lol!